"I don't think it can be killed." Steve McQueen had been in a few films and made some television appearances in the 1950s, but not until the filming of The Blob did he become a star. We see here his film persona of the outsider and the loner who knows how to get things done first take shape as he plays the resourceful Steve Andrews, pitted against an insatiable monstrosity from outer space. The story is well known. While young Steve Andrews (McQueen) and girlfriend Jane (Aneta Corseaut, best known as Helen Crump on The Andy Griffith Show) are smooching on Lovers' Lane, they spot a shooting star fall to Earth nearby. But the first to find the meteorite is an old man (character actor Olin Howlin), who soon finds his hand enveloped in a strange viscous glob that defies gravity. The youngsters take the old man to the doctor (Steven Chase), but in no time the blob has enveloped not only the old man, but the doctor and his nurse as well. The kids try to convince the authorities that there's a monster of some kind killing people, but they're treated like pranksters and ignored until the death toll becomes too high to disregard. How can this thing that gets bigger with every killing be stopped, when neither bullets nor fire nor electric shock will even slow it down? Can it be killed at all? 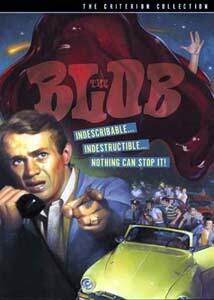 The Blob was conceived by producer Jack H. Harris as a way to meld the two profitable genres of the juvenile delinquency film (such as Rebel Without a Cause or The Blackboard Jungle) and the sci-fi/horror films that were so popular in the 1950s. Although such an idea had been tried before in such flicks as I Was a Teenage Werewolf, it wasn't until The Blob that they really "gelled." Although the leads are really far too old to be playing teenagers, McQueen makes up for it with teenage enthusiasm which causes one to forget his true age before long. He also convincingly conveys his frustration at not being taken seriously (even though the cops have just caught him in a variety of stunts such as driving backwards through town). The attitude of the grownups is best captured with the obnoxious character of Mrs. Porter (Elinor Hammer). No matter how Steve tries to convince the police that the doctor is dead, Mrs. Porter the know-it-all has some contradictory reason to assert otherwise. Of course, the police accept her word, even though she is self-assured to the point of being egomaniacal as well as more than a little goofy ("I'll just dust around the fingerprints."). She's backed up in this attitude by Sgt. Jim Bert of the police (widowed by an accident caused by a teenager), who immediately assumes the worst of the kids, regardless of their earnestness. It's no wonder this film was highly popular amongst the drive-in crowd. While the special effects are fairly rudimentary, they do the job adequately. Once again, the low budget of a film helped make it more effective since we seldom get a really good look at the blob, making it a far more frightening adversary. The fear of something that's practically invisible is almost always more effective than the blatant and readily visible (as was learned in the hapless remake of the film in the 1980s). Had the filmmakers had a budget twice as big, this very well might not have been nearly as good a film. The sequence in the movie theatre is highly effective (so much so that the next year William Castle lifted it for the climax of The Tingler), and the suspense as the blob attempts to eat the diner where Steve and Jane have sought refuge is quite visceral. Of course, the campy theme song "Beware the Blob" by a then unknown Burt Bacharach doesn't hurt the enjoyment of the picture. Image Transfer Review: Criterion's transfer is in a word, breathtaking. The colors are almost preternaturally vivid and gorgeous, without being oversaturated. The colors are brightest on the kids (such as the robin's egg blue of Steve's car), in high contrast to the drab colors of the adults. This transfer really highlights the distinction between the two color schemes. Details are extremely crisp and well-defined. The widescreen format makes the careful composition work very nicely; for a first feature film this is a very attractive effort by director Yeaworth. Blacks are not any darker than a dark grey, but that is no doubt a function of the low-budget nature of the film. Almost zero film damage is visible (I saw one fleeting white speckle, and that's all). It's very hard to believe this is a film made over 40 years ago. A very beautiful transfer. Audio Transfer Review: The audio is a decent mono, plagued with intermittent hiss and noise. The dialogue is clear, and the music seldom distorted (though the main title music is occasionally compressed-sounding and clipped). The hiss and noise come and go, and range from nominal to fairly severe. It's unfortunate that Criterion wasn't able to work the same magic with the audio that they did with the image, but this will do as long as the listener isn't too critical. Extras Review: Criterion gives us a packed special edition here, with two full-length screen-specific commentaries and a wealth of promotional materials. A somewhat faded original trailer is included, in anamorphic 1.85:1. This trailer really highlights just how beautiful this transfer is. The first commentary is an edited-together narrative of producer Jack H. Harris and film historian Bruce Eder. Harris emphasizes the marketing of the film, and how he turned from film distribution to filmmaking with The Blob. He also has a number of good anecdotes about how difficult McQueen was already, even though he was by no means a star. The comments on Daughter of Horror, which is seen in the theatre sequence, and pointing out a young Ed McMahon staggering through the graveyard are also highly entertaining. Eder gives plentiful background on the various players, highlighting their careers. The second commentary is primarily that of director Irvin S. Yeaworth, relating how certain effects were done and how the film was made. Intercut with his commentary are some comments by actor Robert Fields, who plays one of the teenagers, Tony. Yeaworth is quite softspoken and is actually quite surprised about how well the film holds up. Fields gives a great many anecdotes about his relationship with McQueen during filming; he was apparently a great support to the other members of the young cast. We also get a fair amount of information regarding McQueen's affection/embarrassment relationship with the film that made his career. Surprisingly, there's very little duplication between the commentaries, an indication of careful editing by Criterion. A section of Blobobilia is included, which consists of a great many stills and behind the scenes photos, promotional materials from around the world and even a photo of a chunk of the Blob in a bucket! Rounding out the package is a poster of the film, which unfortunately has to be folded to fit into the case. It's an attractive reproduction, full of hyperbole and drama, that gives an appreciation for Harris' marketing skills. An entertaining little bit of sci-fi history, given an exquisite transfer by Criterion, with a pack of extras. Very highly recommended!